STAR BOXING’S “Rockin’ Fights” series has seen major success at the Paramount since its creation in 2011. The chic Huntington venue has become the hub for boxing on Long Island. Promoter JOE DEGUARDIA continues to develop world-class talent at The Paramount, most notably world champion, CHRIS ALGIERI, light heavyweight sensation, JOE SMITH JR., and Long Island knockout artist CLETUS “THE HEBREW HAMMER” SELDIN. DeGuardia says the fighters developing at the Paramount feed off the great Long Island boxing fans that come out in droves to every “Rockin’ Fights” event supporting their local favorites. Chris Algieri (21-3 8KO’s) defeated the feared Rusian Provodnikov, on HBO at the Barclay’s Center in 2014, getting off the canvas in round one, to earn the World Championship. Algieri later went on to face some of the biggest and best fighters in the world, including Manny Pacquiao (in Macao China), Amir Khan, and Errol Spence Jr.. Algieri first fought at The Paramount in 2011, and his eight appearances at The Paramount developed him into a world champion. Cletus Seldin (21-1 17KO’s) started his reign at The Paramount in 2011, leading way to becoming the venue’s all-time wins record holder. During his sixteen fights at The Paramount, Seldin owned an unblemished record, recording fourteen knockouts over that time. During his time at The Paramount, Seldin earned the WBC International Silver Super Lightweight title, which eventually led to his HBO appearance against Roberto Ortiz, in which Seldin lived up to his name, “The Hebrew Hammer”, destroying Ortiz in three-rounds. 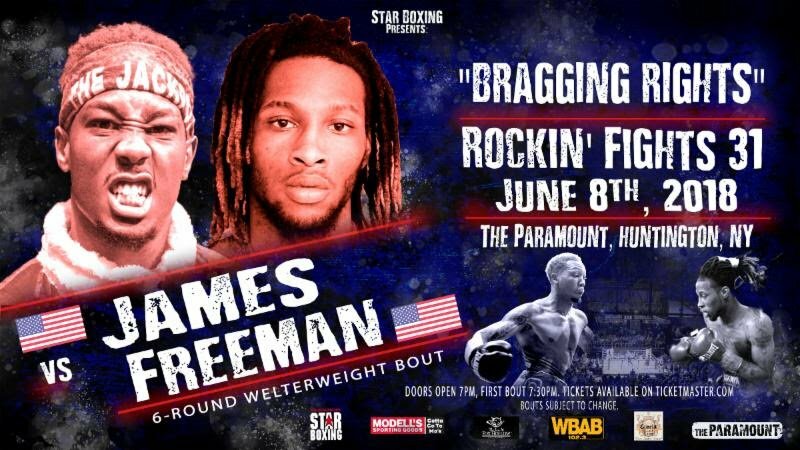 “Rockin’ Fights 31” will give fans the chance to see if undefeated Elmont prospect TYRONE “PRETTY BOY” JAMES (7-0 4KO’s) is likely to be the next star to come out of The Paramount. Fans can see and evaluate if James can follow the footsteps of the elite alumni of the Paramount and break on to the biggest and brightest lights in the boxing. Tyrone’s fans certainly can feel it as he has begun to bring the same enthusiastic fans that have made the Paramount such a breeding ground for boxing’s bright lights. Tyrone comes from an athletic background as his father, Derell, was a standout professional football player for the Oklahoma Outlaws of the USFL and his uncle Jerry was a National Golden Glove champion. Tyrone began boxing at the age of 10, and as an amateur, he won the Nebraska Golden Gloves and became a five-time Junior Olympic champion. He had a stellar amateur record of 79-16. Fighting five-times at The Paramount, Tyrone James has shown promising speed, and growing power every fight. In his last appearance, he stepped up to face Alex DeJesus (then 13-3-1 10 KO’S). In the third-round at the 1:43 mark, Tyrone landed a flush left hand, stumbling DeJesus, followed by an onslaught of combinations, as the referee called a stop to the action. On June 8th, Tyrone James will face Keasen Freeman (4-2 2KO’s) of Aiken, South Carolina in his sixth bout at The Paramount. Freeman has recently taken on the likes of Gary Russell (6-0 6KO’s) and Irish prospect Aaron McKenna (3-0 2KO’s). James is looking to climb to the top but the tough Freeman looks to stand in his way. GET YOUR TICKETS TO ROCKIN’ FIGHTS 31 TODAY! Featured in the main event is Queens native, DANNY “EL GALLO” GONZALEZ who is in search of his eighth consecutive win at The Paramount. See the next generation of New York rising stars such as TYRONE JAMES, MICHAEL STOUTE, JOHNNY HERNANDEZ and JOHN ARROYO.